Mono Lake (rhymes with "OH no") is the largest natural lake wholly within the state of California. Once endangered when water feeding it was diverted toward the Los Angeles basin, it lost half its volume in the 40 years before an agreement was reached to save it. Today, Mono Lake is lower than the targeted level of 6,392 feet. Drought conditions slowed progress toward the goal, and it could take well into the 2020s before it reaches that depth. The best-known features of Mono Lake are its dramatic tufa (TOO-fuh) towers. Over time, rainfall at Mono Lake did not keep up with evaporation, and minerals in the water built up. The lake is now 2.5 times as salty and 80 times as alkaline as the ocean. When the lake level was higher, freshwater springs flowed into the lake under the surface and reacted with the lake's minerals to form the dramatic, cement-like calcium carbonate spires and towers that line Mono Lake's shores today, looking like abandoned ancient cities. As the lake fills up, the tufa towers are less prominent, and the wonder of seeing them has diminished. That's not to say it's a bad thing for nature overall, but if you want to see those tall, craggy towers, go as soon as you can before they disappear. Mono Lake Visitor Center: At the visitor center just off US Hwy 395, you can see exhibits about the area's history. The center is also the best place to find out about current conditions and get some expert advice. South Tufa Reserve: The most dramatic tufa towers are on the south shore. You can walk among them, at least for now. Naturalist Tours: In the summer, you can take a boat tour or a walking tour of the tufa towers. Photography: The Mono Lake tufa towers make dramatic photographs, especially with a colorful sunset behind them. Depending on the day, sunrise and sunset can both present spectacular photo opportunities. If you choose to go at sunset, arrive at least an hour before the "official" sunset time, as the sun sinks below the mountains earlier than you might think. Lake Tours: The best way to get to know Mono Lake is to get out on it. You can take a canoe tour with Caldera Kayaks or one sponsored by the Mono Lake Committee. Bird Watching: In fall, many migrating birds stop at Mono Lake, which is on the Pacific Flyway, a major migratory route. Mono Lake has no natural outlet. Over time, minerals and other chemicals have built up in its water until it became saltier than the ocean and as alkaline as chlorine bleach. Fresh-water springs pump calcium-laden water up from the lake's bottom, and the reaction of the two creates rocks that build up like stalagmites in a cave. These are the tufa towers. Until the lake's water was diverted in the 1940s, they were hidden under water, but today they stand above the water level like an odd, abandoned city. South Tufa Reserve is a common stopping point for visitors. The tufa towers here are worn from people climbing on them, hiding the delicate texture you'll see in other tufa towers viewed from a boat. The Mono Lake Alkali Fly (Ephydra hians) thrives in the lake's unique chemistry, making them a common sight for visitors. During the peak of summer, millions of them settle around the lake's edge, flying only a few inches off the ground when disturbed, like a black cloud. Native Paiute Indians called the pupae "kutsavi," harvesting it for food during the summer. Today, it helps feed the birds that flock to the lake. Besides the tufa formations created by water bubbling up under the lake's surface, the lake's minerals also form white calcium carbonate deposits that can coat other types of rocks or anything else it comes in contact with. If you look closely, you can see some spots where it has flaked off the underlying rocks. To view these limestone deposits out on the lake, you can get there under your own human power, or Caldera Kayaks or Mono Lake Committee offer canoe tours. Mono Lake plays a vital role in the Western Hemisphere's bird migrations, with up to 100 species stopping over during their annual travels. The tiny Red-Necked Phalarope, no bigger than my fist, stops by on its way to South America. These strong fliers molt and pig out on brine shrimp, doubling their weight in just a few weeks. In September, they take off for a non-stop 3,000-mile flight to the Andes. Also in fall, almost 2 million Eared Grebes touch down on the lake. Even more voracious than the Phalaropes, they may triple their weight before moving on. Osprey make their nests atop some of the lake's tufa towers. In June, the big influx is bird-lovers, when the annual Bird Chautauqua gets underway. This popular event, which features field trips, lectures, and other bird-oriented activities, is so popular that spots are assigned by lottery. This black, rocky island is made up of three separate lava flows. White, cliff-like structures were formed when the lake level fell. When the lake falls below 6,375 feet, a land bridge connects Negit Island to Mono Lake's north shore, allowing coyotes access to the island and the nesting seagulls. The 1953 film Fair Wind to Java starring Fred MacMurray and Vera Ralston left behind abandoned scaffolding after the film's wrap. The scaffolding stood in for the famous volcano Krakatoa. A building from the set also still stands on Paoha Island. There's no doubt the most famous movie made at Mono Lake is High Plains Drifter starring Clint Eastwood. The fictional town of Lago stood on the lake's south shore, near the South Tufa Reserve. In the 1930s, when the lake level was higher, a geyser and hot springs on Paoha Island prompted a local entrepreneur to build a small resort here, catering to people with tuberculosis. Visitors will see remnants of this time, including resort lodgings. Freshwater springs still bubble up on the island, creating an environment that is home to several deer, whose ancestors apparently swam out to the island. An early settler built a homestead on Paoha Island but later abandoned it, leaving behind a herd of goats that remained on the island for many years. Methane gas percolates up through the lake floor, creating bubbles on the surface. The water's alkali content gives it a slimy, soapy texture, creating the appearance of soap bubbles. Mono Lake is accessible to any kind of boat, but most of the watercraft used are canoes or kayaks. Mono Lake Boat Tours is one of the best ways to explore many of the lake's hidden points of interest. One tufa tower is located on the west side of Mono Lake, accessible only by boat. Because of this, it's undamaged compared to the ones that are easier to get to. In this tufa garden near the old marina, you'll also find ospreys nesting atop some of the spires. In other places, you can see the spring water bubbling up from beneath the surface. Brine shrimp (Artemia monica) are readily visible from the lake's edge. The lake water looks oily because fresh water on the surface is trying to mix with the saltier lake water underneath. One species of brine shrimp is about the size of a thumbnail and is found only in Mono Lake. Like all brine shrimp, they can tolerate very salty water. 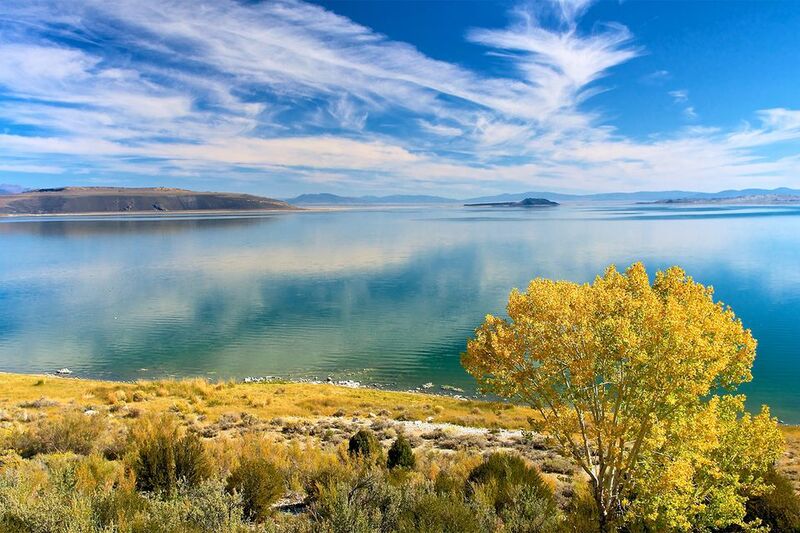 According to the Mono Lake Committee, 4 to 6 trillion of them inhabit the lake in summer. They provide abundant food for local birds. There's plenty for everyone until fall when nearly 2,000,000 Eared Grebes arrive for "shrimp cocktail." In winter, all the shrimp die when temperatures drop. They reappear the following spring, hatching from tiny, dormant eggs produced by females before these females died the previous winter. Those so-called cysts spend the winter on the lake bottom, then develop into baby shrimp went it's warm enough. The first generation of adult shrimp peaks in May and June, followed by a second generation in August and September. The number of shrimp in each generation depends on conditions that include temperature and algae growth. If you want to photograph the lake in afternoon light, get there an hour or two before official sunset time. The sun drops below the mountains well before then. The water in the lake feels slippery or soapy. It can deteriorate your shoes and clothing if you get it on them repeatedly. If they get wet just once, a good wash should take care of the problem. The lakeshore is muddy and sticky. In fact, there's a spot north of Lee Vining that's nicknamed "Sneaker Flat" because so many people leave their shoes behind, stuck in the mud. Swimming in the lake is like swimming the Great Salt Lake or the Dead Sea: the water's so salty you can't sink. There is a day-use fee for the South Tufa Reserve. The Mono Lake visitor center is located just off US 395 north of Lee Vining. The South Tufa Reserve is east of US 395 on CA 120.